For as long as I've loved SCRABBLE, I can't believe I've never come across this before. "CRAZIEST" - A short story by Liz Dubelman about words and numbers as a religion (think Pi), about SCRABBLE being the oracle, about her quest for the "triple-triple". This spoke words to me. Literally and metaphysically. If you haven't seen this yet, watch it. Listen to it. Absorb it. Let it touch your heart. It's a story about the "craziest" SCRABBLE player. Maybe even more than you. * You can download and listen to the MP3 version if you prefer. Now, wasn't that delightful and refreshing? It's clever and the words resonate with so many different connotations. 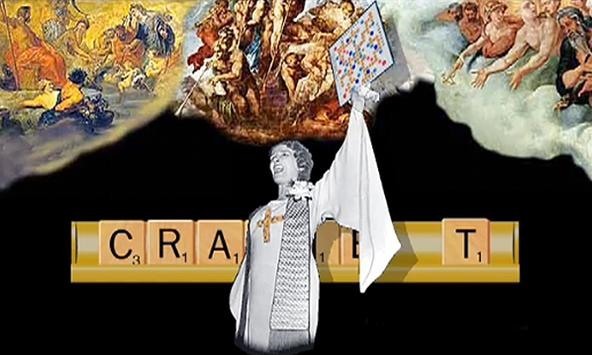 SCRABBLE is almost a religion to me, and I'm sure it absolutely is to others. But is Liz telling a true story, or is this simply a fictional piece? 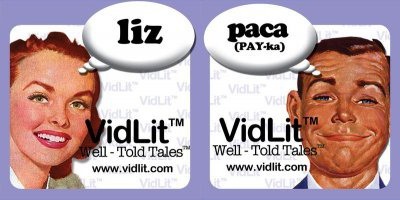 Liz Dubelman is the founder of VidLit, a website that produces what the name suggestions — video literature. They take a story, article or excerpt from a book and turn it into a visual medium, a sort of book video trailer full of Flash animation. 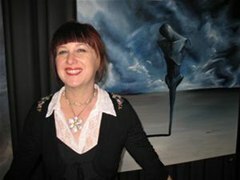 Before VidLit, she spent ten years in film production. Her television work earned her two Emmys — one as a producer in 1994 (credited as Elizabeth Dubelman) for Heroes of Conscience: A Tribute to Dietrich Bonhoeffer, about the German clergyman and theologian who plotted to assassinate Adolf Hitler. You can watch a clip of this at The Church of St. Joseph of Arimathea. The other win was for directing (?). "She was the first woman member of the labor negotiating committee of I.A.T.S.E., New York local 644 (cinematographers), and is an establishing member of Women in New Technology. She has been consultant to all of the major studios in the area of digital rights and Internet content. Ms. Dubelman is a graduate of Hampshire College. She is awaiting publication of her first novel." Okay, now that that is out of the way, I should mention that she is not a member of the National SCRABBLE Association (NSA), nor has ever been. But she may, in fact, have a love for SCRABBLE. "CRAZIEST" was conceived after Dubelman listened to Bookworm with Michael Silverblatt on KCRW (her local NPR station). That day, his guest was Myla Goldberg, who wrote "The Bee Season," a novel about a girl who attempts to win the national spelling bee. "I thought, if spelling bee champions are weird, Scrabble players are at least as weird. I began to explore people who build "thought castles" — people who take thinking too far. What would make someone need to create her own order? Who would that person be that would have such a strong need for magical thinking?" This SCRABBLE short was one of her first videos for VidLit, which started a revolution, but it remains one of the best examples of what VidLit is all about. 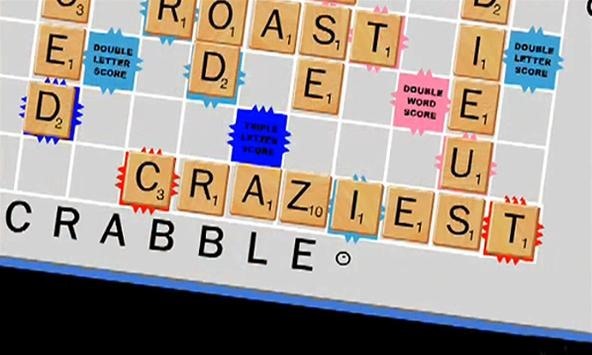 Facts, Notes & Observations for "CRAZIEST"
"CRAZIEST" is about six years old, so of course there are some inaccuracies when it comes to SCRABBLE facts. Thought I should share them for anyone who is interested, along with some general facts, like "What is a triple-triple?". If this video was made in the last couple of years, and if she were actually a member and were still playing in championships, she would have to be a member of the North American SCRABBLE Players Association (NASPA), who now govern and control tournament and club play. She states that CRAZIEST is the "current single highest scoring acceptable play in NSA club or tournament history" with 311 points, but in 2006 it became QUIXOTRY for 365 (OSPD) thanks to Mike Cresta. If you're a SOWPODS player, it's CAZIQUES for 392. A "triple-triple" is a play that covers two Triple Word Score squares simultaneously. Hasbro states, "To compute the total score for the play first add up the values of the individual tiles, counting the Double Letter Score bonus if it's applicable. Then multiply by NINE. 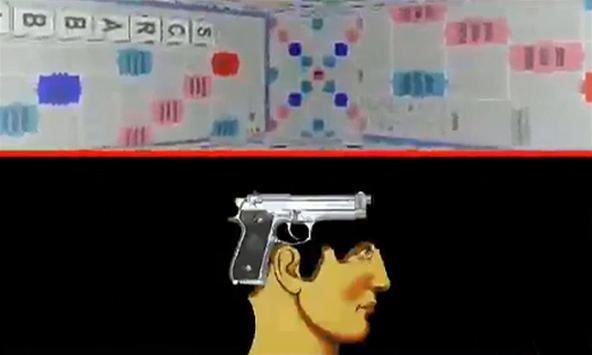 If all seven tiles of the player's rack have been used for this play, then add an extra 50 points." She did not go to Cornell, she graduated with a BA from Hampshire College in 1984. Albert Hahn did NOT die of a triple-triple induced heart attack during a SCRABBLE game. The Canadian player is alive and well and still competing in SCRABBLE clubs and tournaments. Hahn was runner-up in the 1991 Canadian National SCRABBLE Championship (CNSC). Hahn added an S to the word ADIEU. You can also add the letter X, spelling ADIEUX. I doubt anyone would ever just place an S on a word as depicted, especially a word like ADIEU, because it's not many points, and it gives the other player an opportunity to use the Triple Word Score, maybe even both of them. It's a bad move. Period. The love of words and numbers, Jewish mysticism, God... the true meaning of life? This sounds like familiar territory. Darren Aronofsky deals with such issues in his first full-length feature film, Pi, in which a paranoid mathematician searches for a key number that will unlock the universal patterns found in nature. Alas, no SCRABBLE. But there was Go. Mitchell Thompson (aka farsidedude), directed a short film based on Liz Dubelman's short story about an obsession with SCRABBLE. It's almost a word-for-word rendition, except the ending isn't a suicide. Instead, he decides to smash Albert Hahn's face in. You can watch it below. I've scoured the internet for a transcript of Dubelman's story, but could not find one. I felt someone had to transcribe it, because it is just as good on paper as it is on video. So, check it out below. I live for the Triple-Triple. The word CRAZIEST spanning two Triple Word Score squares, with the Z falling on the blue Double Word Score, using no blanks. The score is 3 + 1 + 1 + (10 x 2) + 1 + 1 + 1 + 1 = 29 x 9 = 261 points + 50 points = 311 points. This is the current single highest scoring acceptable play in NSA club or tournament history. It was played in 1996 at a club in Detroit, Michigan. I've always felt that if the universe were to give me a chance at a Triple-Triple, it would be a giant nod, the higher powers giving me a cosmic pat on the back, and saying 'go forth and spread the word' — SCRABBLE is a religion. I don't mean this metaphorically. Well, no more than all religions are metaphors. I'll tell you how I found my religion. I always believed that all letters were NOT created equal. I mean, they all are obviously important, but they clearly don't all have the same value. Look at Q. It's not even in the word CRAZIEST. A novice would assume that the highest score would involve a Q. When I was a child, I thought that each letter had its own personality. Back in 1984, I was 21, a senior at Cornell. It was four in the morning and the coffee was strong, even bitter. But after the first cup, I liked the bitterness. The bite made me feel alive. On the radio, a bass-voiced man on some public radio talk show droned on about Jewish mysticism. He said something about how numbers had meaning and God speaks to everyone, and it clicked for me. I had the first of two, almost three, religious moments. SCRABBLE is the oracle. I got out the board. It had been my mother's. I held the smooth tiles and then, like Mia Farrow in Rosemary's Baby, it all came together. I pulled out the dictionary and laid it, thump, on the table. I found words that had 9 letters or less. I added the numbers. I figured out the sweet sixteen… 16 words you could make if you have a Q, but no U. Words like QAID, a Muslim leader, or QANAT, a system of underground tunnels, or SHEQEL, an ancient unit of weight in money. What was the board trying to say? What did I need to know? I missed my finals. It didn't much matter. I no longer needed a degree to give my life meaning. I was the new Joan of Arc. A few days later, the second epiphany came to me. Life is a game of patterns and chance, and those who play well will win. I joined the National SCRABBLE Association. I tried to talk to my father. Not to get his approval, but to bring him joy. After all, he is the father of a seer. That must mean he's chosen to. He thought I had a nice hobby. He was happy I was making friends. Hobby? Friends? Sometimes I think we're not even related. My mother died when I was 13. She was in the wrong place at the wrong time — a stray bullet. We never talked about it. My father checked out after that. He sent me away to a girls boarding school. I guess I reminded him of her. I buried myself in books. I lived in words and numbers. I tired not to come home because it just made him sad, and I had found a life. Letters and numbers danced in my head. Before I'd fall asleep, my number and letter friends would act out little plays for me. They'd comfort me and make me laugh. I had no human friends. I don't think anyone even really noticed me. Why should they have? I don't remember playing SCRABBLE before I joined the NSA, and as I said, I didn't really have anyone to play with. I was under no delusion that any of the members of the organization would know that they held the oracle. I had been chosen to tell them in good time. But what a happy surprise it would be. They would be ahead of the game. The others would have to learn the game. And those poor impaired souls, like the dyslexics, well, they'd have a harder path. I was prepared and up to the task. I always felt I had a lot to give. The NSA taught me the rules, and I played game after game. After each one, I would copy the board into a notebook so I could define the true meaning. I have over 1,700 notebooks, and each tells a tale as meaningful as the bible. The books are layered in in words and numbers, but the message is clear. Life is patterns. Learn the rhythms, the repetitiveness, and when you have that down, when you can recognize the beat, life will change. It will shake you and turn you on your ear. SCRABBLE will give you clues to the future, but very hard clues. After I won the National, I gave a speech. I spoke like a cross between Alex Trebek and Jesse Jackson. I was inspiring and motivating, clear and instructive, I gave them just what they could hear and not too much. I told them about patterns and chance. They were on their feet. NSA members are not known for their wild behavior, so this was something. Nonetheless, I could see that they weren't ready to hear that they were chosen. I was waiting for sign — the Triple-Triple. In retrospect, I could see that I didn't handle things well. I was playing Albert Hahn. We'd been playing for about 13 minutes when I saw my chance. I had the letters C, R, A, Z, I, E and T, and I had the opportunity. The board was mine. The gods were saying, 'now is the time to tell the truth'. I would place my tiles and make my speech and everyone would know. I was trembling. Albert was placing the S in the word ADIEU when he grabbed his chest and killed over. This man was 53. His heart was so bad he shouldn't have played. The game was called. I never laid down my tiles. Let me say at this point, I am not insane. I have an IQ of 167, and I figured this out. I'm not using, nor have I ever used drugs. I know what's going on. I know my rights. I have a permit for this gun. God speaks to me through SCRABBLE. Don't you see?